NEW! 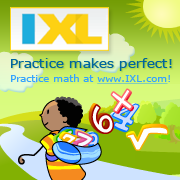 IXL recently released their first workbook, focusing on math for grade 3. The problems look to be on par with what is on their website, meaning they're the best around. It's also priced very reasonably at $8.99. 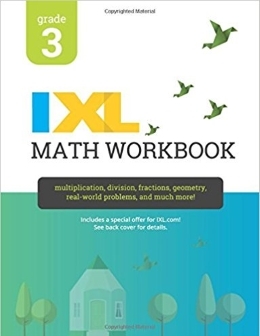 Learn more and get it here on Amazon: IXL Math Workbook, Grade 3. Generate math worksheets galore from 1st grade number charts to 7th grade proportions and square roots. Customizable and randomly generated. Find free math lessons from 1st grade addition to percent (elementary & middle school). We also offer articles on mathematics education topics, such as calculator usage, help with word problems, kindergarten math, summer math, and more. Homeschool math curriculum guide— articles, scope & sequence chart, how to find inexpensive math materials, and reviews of ALL popular homeschool math curricula left by my site visitors. A very comprehensive list of online math games and resources, arranged by math topic from addition & subtraction all the way to geometry, algebra, and calculus. Detailed reviews of dozens of interesting math products, such as Giggle Facts, Dr. Math, Harold Jacobs, Mathletics, IXL, YourTeacher, Time4Learning, Math Goodies, Hands-On Equations, etc. etc. My math videos at Youtube teach both the teacher and the student. These will also work as lesson plans for teachers.